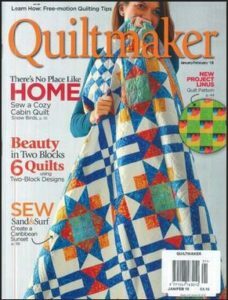 Recently I bought the January-February 2018 issue of Quiltmaker magazine. I remember when this magazine started and it was very different to the behemoth that was Quilter’s Newsletter Magazine. I didn’t have a chance to read it until this week when I had to stay home and be quiet for a few days. I noticed several things about it. First, it still has a few quilts from readers who made patterns found in the magazine. I haven’t read many magazines lately, but I don’t remember seeing that feature in some of the newer magazines. Next,There is one page about new notions, gifts, books and “gotta-haves” (pg.8). Third, this is still a pattern magazine. There are 12 patterns in this issue, which, if I worked diligently, would take me over a year to make. The patterns have a lifestyle shot and an easy-to-find straight on shot. Included on one pattern page is a small sidebar that tells the difficulty, the finished size of the quilt and the size of each box. FABULOUS! Patterns also include a coloring page. Not only can you relax with some coloring, but you can also try out your own color ideas without needing to buy EQ8. Some of the patterns have colored in drawings of the quilts as well. This issue had a pull out section with some templates and designs for quilting as well. Fourth, one of the patterns, Sodalite Cabins, includes an artists profile after the pattern. I think this is a nice touch. I always like to know more about people, how and why they quilt. Next, I like their directions for basic quilting instructions. The instructions are for the Stitch and Flip method of adding triangles to a square or rectangle type unit. The description says “Stitch & Flip is the perfect technique for making Flying Geese, Square in a Square’s [sic] and parallelograms without having to sew on the bias” (pg.33). 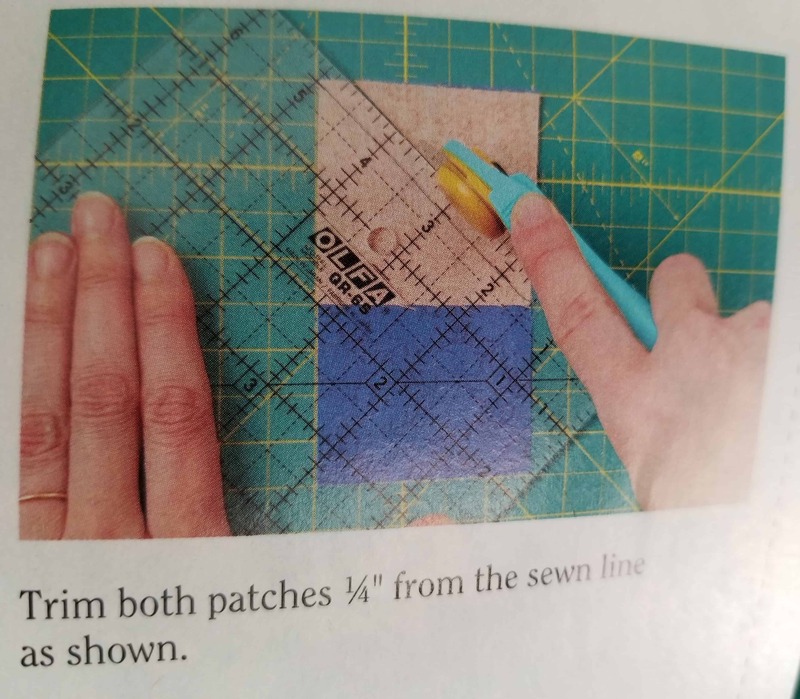 The new Folded Corners Ruler does the same type of thing, but with these Quiltmaker instructions you don’t necessarily need the ruler. There are 6 illustrated and easy to follow instructions to show the reader how to get the job done. You have to buy the magazine to get the full instructions, however what caught my eye was the way the editors showed the particular placement of the ruler. Nice! Fifth, Articles! Yes, the magazine has a few articles, some non-pattern content. A couple of the articles were on using some type of machine for quilting and the last one was a column called Addicted to Scraps. Addicted to Scraps is written by Bonnie Hunter. She is the designer of the various mystery quilts that start around the holidays like my En Provence quilt. In this column she talks about using her Essential Triangle Tool and about making some scrappy blocks that include 4 patches. These are not instructions for a quilt, but you can see a layout diagram for a quilt if you follow the link included on the page. I like this idea as it forces readers to be a little more creative. While I don’t plan to become a subscriber, I am pleased with what I saw in this magazine this week. It sounds refreshing to find enjoyment in a quilting magazine. I haven’t bought one or even taken any of the freebies on the free table at quilt guild for years! They just were not interesting to me. Maybe I’ll take a gander at this one to see if the style is interesting enough to buy it in the future. Thanks for your review! I am cancelling more and more of my magazine subscriptions. Every once in a while I pick up an issue. I just don’t need more patterns. As you can see from my lists, I have plenty of projects on which to work. I’ve been a fan of Quiltmaker for several years. There are always a couple patterns I like. I can’t say that of all magazines. Now that you mention your likes, I totally agree with those too. I wish Bonnie Hunter’s column was longer, but I really liked that she shared a block.